KAMPALA – The latest State of Uganda Equal Opportunities Report 2018 shows that the health sector remains underfunded and heavily dependent on external funds. The report released in Kampala November 14 by the Equal Opportunities Commission presented an annual report to Parliament noting that the status of equal opportunities is still lacking in the sectors of Health, Education, Works and Transport. “Promoting equal opportunities to address inclusion and accessibility challenges of the 21st Century asked government to revisit all these public sectors to help the poor, orphans and persons with disabilities to access quality services. Ms Muwebwa decried the cutting of the health budget sector for the financial year 2018/19 by sh136.6 b from sh1.85 trillion to 1.7 trillion amid the health challenges faced by the country. The report reveals that the health sector remains underfunded and heavily dependent on external funds with major challenges in maternal mortality, drug stock-outs, low staffing, lack of equipment and housing for health workers,” reads the report in part. “Ninety-three sub-counties do not have any government health facilities whereas 225 have a Health Centre II and the majority of the islands in the country lack healthcare facilities whereas those with health facilities lack electricity,” reads the report in part. Ms Muwebwa reported that they have also found glaring imbalances in the state of equal opportunities in the education sector. “Only 8.4 per cent of children aged three to five were attending pre-school in 2017, which translated to over five million children not attending pre-primary school,” she said, adding that, “22 per cent of children aged 15 to 19 are not enrolled in secondary school while districts in northern Uganda have the lowest level of gender parity in secondary schools,” reads the report in part accessed by PML Daily. The report says that although 5,242 students benefited from the university students loan scheme, only 28% who got this loan are girls representing a very big imbalance. “Majority of the students who got loans were male at 72 per cent while females were at 28 per cent presenting a gender imbalance,” the report adds. She added that farmers, especially in the villages, have to obtain money from moneylenders and informal financial institutions that charge exorbitant rates. “Seasonal crop farming is realising negative returns with an average investment of shs3.5 million, and yielding an average of shs2.97 million at a loss yet they acquire this capital through loans,” Muwebwa said adding that “street vendors obtain financial services from friends and relatives to a tune of 92 per cent”. Ms Muwebwa said this affects the ability of people in the informal sector to invest in business yet this should be easy with government programmes that are in place to support informal businesses with loans. This report comes at the time a recent report from Twaweza’s Sauti za Wananchi survey said 1 out of 5 households has sufficient income to cover their daily needs and that one out of five households (22%) say their income is enough to cater for the household’s needs on a daily basis. The report adds that 1 out of 6 citizens has a bank account either alone or jointly with another person with men (22%) are nearly twice as likely as women (12%) to have an account. The report also notes that there are also strong links with age and wealth, with young people (6%) and the poor (6-7%) particularly unlikely to have a bank account while the wealthiest citizens (37%) are the most likely to have bank accounts. The Twaweza’s; New Sauti za Wananchi survey further confirms that there is still a wide income inequality between men and women with the latter earning lesser and that with widening inequality, the women are concentrated in the lower quintiles of the poor. “This means continued marginalization and limited decision-making process. The Equal Opportunities report says that under the Works and Transport Sector, the road network connectivity index within the districts that constitute Lango, Karamoja, Acholi and Elgon is below 50 per cent. 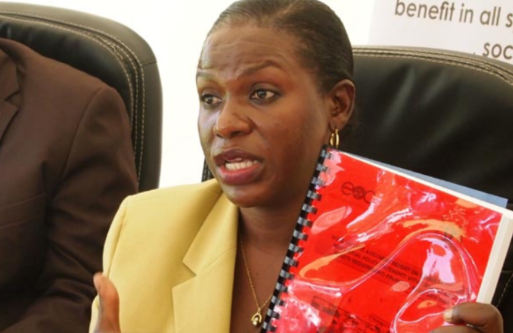 “Seven districts do not have ferry services and remain inaccessible; Uganda has over 160 islands out of which only two have ferry services, ”Ms Muwebwa said. Ms Muwebwa explained further that the works and transport sector demonstrated low commitment to addressing gender and equity concerns for persons with disabilities, women and children with a compliance level of 23 per cent and 38 per cent respectively. Ms Rebecca Kadaga, the speaker of parliament thanked the Commission for bringing to light the disparities in the various sectors and urged the Commission chairperson to address the issues. 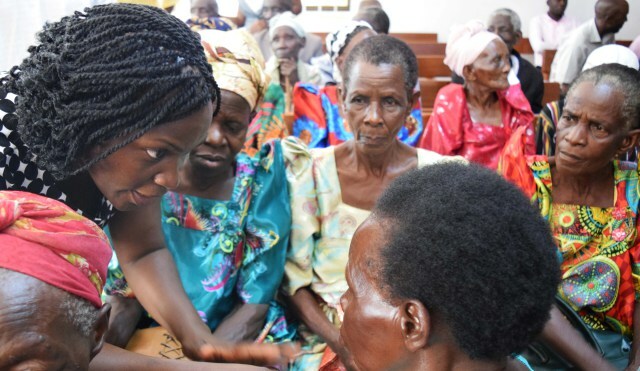 “We need to discuss and find solutions to the things affecting the status of equal opportunities, like why many girls are missing out on the education loan scheme and how we can support the informal sector to access funds,” Ms Kadaga said.